It’s map Monday. 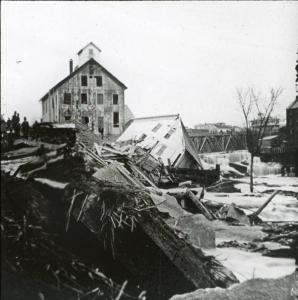 Our last post here at Historyapolis dug into the buried history of the Minneapolis riverfront, and explored the intricate tunnel system that powered the city’s milling district. These subterranean canals were the lifeblood of 19th century industry. Today, we are going back underground to examine another lost piece of industrial history. This web map tells the story of the Eastman tunnel and its catastrophic collapse in 1869—one of the largest disasters the city has ever seen. The tunnel was the brainchild of William Eastman and John Merriam. In 1865, the two businessmen purchased Nicollet Island. They dreamed of exploiting the power of the nearby falls, and in 1868, began constructing a 2,500 foot tailrace tunnel. This tunnel–dug deep below the Mississippi riverbed–would power the mills Eastman and Merriam intended to build on Nicollet Island. The venture was a fiasco. In 1869, the tunnel collapsed and the river flooded in, creating a massive underground vortex. 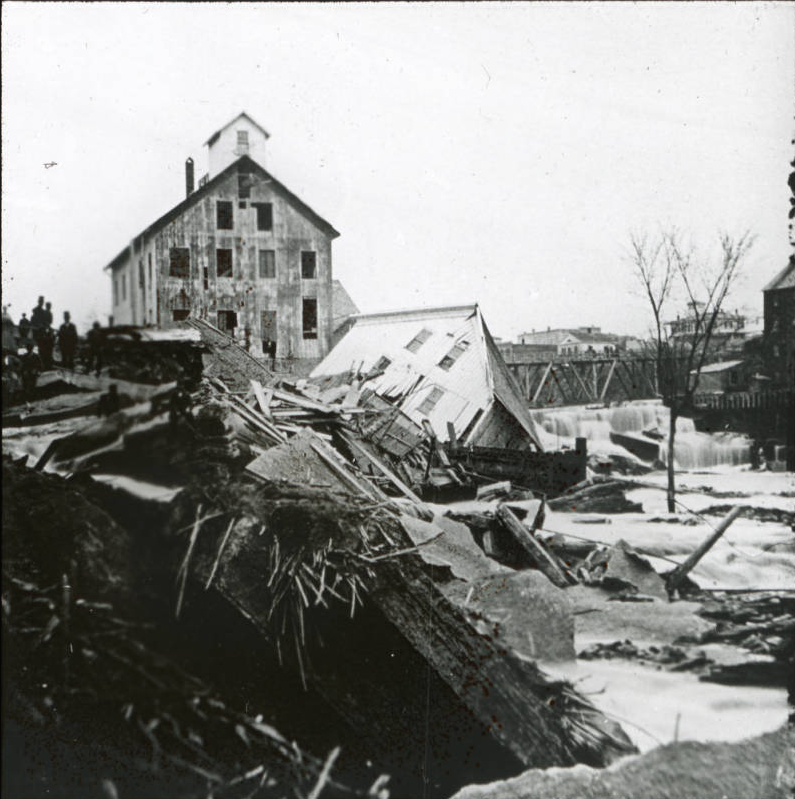 Over the next six years, recurring collapses turned the riverfront into a series of sinkholes and whirlpools that swallowed multiple mills. Minneapolis and St. Anthony both faced economic ruin. The immense water power “at the base of their prosperity” was at stake. If left unchecked, the “tunnel disaster” could destroy the falls and permanently cripple urban development along the river corridor. Without a waterfall to build on, Minneapolis would lose its reason to exist. This geo-spatial application attempts to shine new light on the tunnel that nearly wiped out the milling district. Click through the application for a tour of the ill-fated tunnel, and see the impact its collapse had on the city. Images used in this post are from the Hennepin History Museum. The application was built in collaboration with the Borchert Map Library. The 1861 map used in the application was provided courtesy of Borchert. Other sources include: “River of History: A Historic Resource Study of the Mississippi National River and Recreation Area,” “Engineering the Falls: the Corps of Engineers’ Role at St. Anthony Falls,” The Minneapolis Tribune, and the “Field Surveys under Direction of F.C. Farquhar on 1873 and 1875,” from the City of Minneapolis Municipal Archives. This entry was posted in Map Monday and tagged Minneapolis, St. anthony falls, tunnels.